Dads with a knack of magic are always a hit with kids. 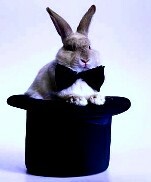 Performing a magic trick in front of children is home-grown show business, full of highs and lows, and hits and flops. A Dad is only as good as the last magic trick he performed for the little audience. Like any act faced with dwindling number of encores, Daddy’s Magic Show must be full of new surprises, and at least one new trick to keep the interest going. In short, to keep them happy, Dad’s gotta be snappy! The Klutz Book of Magic – As usual, the Klutz people put together a compelling low-cost package of tricks for kids (and adults) 8+. This book is especially good because it comes with five physical props in a little kit on the front. Kids, especially the younger ones, love tricks that work right “out of the box.” These tricks are not simple, but the props make them more compelling and won’t frustrate a child on a plane or vacation where “common household items” might not be accessible. The book explains the basics from “palming a quarter” all the way through making a handkerchief disappear.